Good day our dear readers, recently we could all see that almost all the loop holes in getting free cheats from our dear network carriers: MTN, GLO, AIRTEL & 9MOBILE had been blocked. In lieu of this, have came up with this amazing offer in which have been enjoying all this while. Right here, am going to unveil detailed steps of how to get Double Data Bonus Offer On Mtn, Airtel, 9mobile and Glo network. This offer was innovated by MTN last year, then follow by AIRTEL but now GLO and 9MOBILE had join the train by providing extra data bonus to their subscribers. If you have not once receive notification about double data bonus on your line from MTN, you can request/activate this offer yourself just by sending some short codes to their USSD number. i.e. To check whether you are eligible for the airtel double data offer all you have to do is to dial *144#. **all Subscription last for 30days. 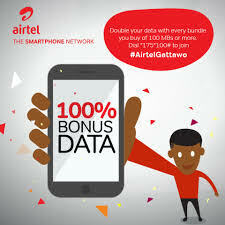 Double Data Bonus Offer on GLO is totally different, why? they have a condition that binds there subscriber's eligibility. You must subscribe to a plan of 30days by dialing *777# without getting Double Data then on Auto Renewal after 30days you will be credited with Double Data automatically. Note: you must have recharge your line before the expiration day. With the above mentioned networks, let us know which of them you enjoy subscribing on most? and also which double data plan interest you most? 1st to know if u are eligible simply dial the subscription code *440*161# and if u get in insufficient balance error then u are game otherwise try a different sim. I am using mine on a modem on my PC and as far as browsing(renders pages swiftly) and downloading(average 250kb/s as at this evening) its been awesome..
About whether it zaps, Yes it does.. EXACTLY TWICE AS MUCH (remember i said i am using on a modem). The plan is for BB but its been allowed to work on other devices as well. Maybe it may be different on the its original device which is the BB. But Airtel clearly warned in the activation msgs that "...experience and charging may differ in other devices." Perhaps someone with a bb device can try it and share thier experience here too. For me, i think a #1500 plan for 3gb(half of the 6gb) data after zapping has been applied is a fair deal and probably the best especially coming from a FAST and constantly upgrading network like Airtel. M already a fan of MTN Double Data .